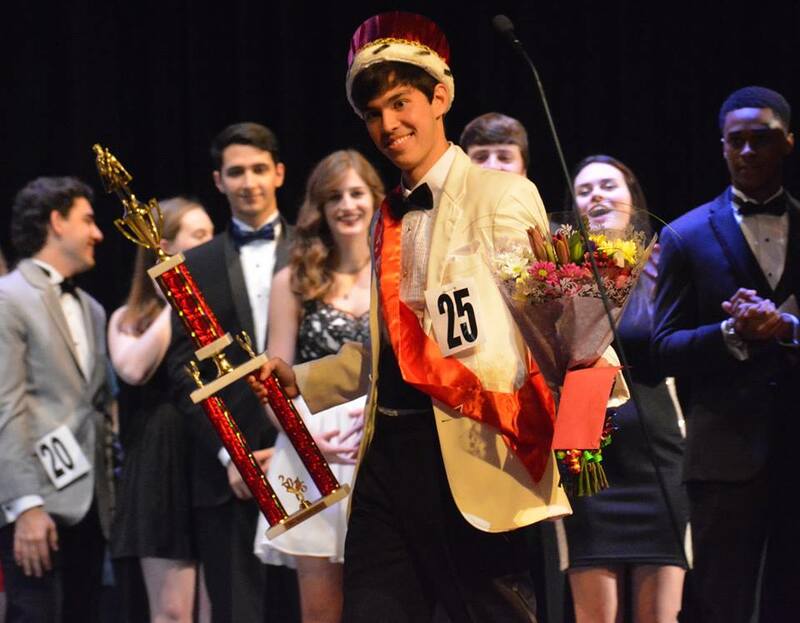 Congratulations to Ben Williams who was crowned Mr. Bellaire 2016. The 25 young men and women from the Class of 2016 that participated in the event engaged and entertained the crowd and made us #CardinalProud . Thank you to all of the event's sponsors and Ms. Andy Blitzer and her team of volunteers for coordinating the event for the Class of 2016. All proceeds from the event benefit After Prom and senior class activities. Austin Abbott escorted by Brette Crocker. Austin is sponsored by Shrader & Associates. Brandon Acuff, escorted by Anastasia Ochsner. Brandon is sponsored by Basaldua Heller Family Practice Physician. Kolin Ariza, escorted by Libby Lorenz. Kolin is sponsored by THE BUZZ MAGAZINES. Libby is sponsored by Lorenz Financial and Insurance. Jamere Crawford, escorted by Dorcas Solarin. Jasmere is sponsored by George W. Lunnon, Jr., State Farm Insurance. Dorcas is sponsored by Lighting Inc.
Sina Dabiri, escorted by Payton Gasper. Payton is sponsored by Candelari's Pizzeria. Matthew Graves, escorted by Izzy James. Matthew is sponsored by Belen Rivera, Elizabeth Hair Salon. Izzy is sponsored by True Beauty Spa and Salon Store. OJ Hernandez, escorted by Abi Congdon. O.J. is sponsored by America Hernandez, Better Homes and Gardens, Gary Greene. Abi is sponsored by CW Lighting. John Hubbell, escorted by Elizabeth Howes. Elizabeth is sponsored by Lighting Inc.
Michael Joseph, escorted by Ashli Alvizo. Michael is sponsored by American Sleep Labs and Ashli is sponsored by Mirador Group. Colin Kurtz, escorted by Robin Wesley. Colin is sponsored by Mike Livingston, Realtor, Keller Williams Metropolitan. Jonathon Mills, escorted by Katelyn Christie. Jonathon is sponsored by Mitch Beasley, Realtor, Heritage Texas Properties. Deven Narayan, escorted by Dani Kaiser. Dani is sponsored by the Kiel Law Firm. Deven is sponsored by Paradigm Training Center. Kai Nichols, escorted by Juliet Stavinoha. Kai is sponsored by Outsmart Magazine. Jordan Orsak, escorted by Rebecca Leisten. Jordan is sponsored by TOPs Hearing and Balance Center. Rebecca is sponsored by Robert Leisten/Diagnostic Foot Specialists. Brandon Pereira, escorted by Skyler Fariss. Skyler is sponsored by Tejas Office Products. Samhith Punukula, escorted by Erin Wallace. Hector Ramirez, escorted by Erin Lai. Both Hector and Erin are sponsored by Vision Source Meyer Park. Julian Salas, escorted by Maddy Walshak. Julian is sponsored by The Ticket Experience. Vikram Seth, escorted by Madeleine Dunn. Ashkat Sood, escorted by McKenna Compton. Ashkat is sponsored by M. Wiesenthal Men’s Collections. McKenna is sponsored by Higdon Compton Agency. Jared Stewart, escorted by Shayna Brochstein. Jared is sponsored by Rockstep Capital Corp.
Edward Wen, escorted by Meera Aiyer. Edward is sponsored by Stone Acorn Builders. Ben Williams, escorted by Emma Cohn. Emma is sponsored by ACQ. Thank you to Al's Formal Wear for sponsoring all our boys with tuxedo rentals. Thanks so M. Wiesenthal Men's Collection, Sherry Noblett, Vision Source Meyer Park, Shopaholic Sanctuary, Reginelli’s Pizzeria, Candelari’s Pizzeria and Kubos Sushi Bar and Grill for their donations. Student Emcees: Greer Blitzer, Erin Rice, Allie Henderson and Pierre Segard. Duy Nguyen, banker and founder of Soundbox Studios.